Different types of wood have different burning characteristics. The best type of wood to burn in your fireplace will vary depending on where you live. Good firewood should be inexpensive. How inexpensive the wood is depends partly on how far it has to be transported. Local wood costs less because it doesn't have to be hauled as far. Different types of wood also split and burn differently. You need to consider characteristics such as how much smoke the wood gives off and whether the wood pops or throws off sparks while burning. You also want to find wood that yields a lot of heat. Splitting wood lets it dry out faster and also reduces the size of the logs. Woods that have interlocking grains or a lot of knots are harder to split. Usually, green wood and softwoods are easier to split than dry wood or hardwoods. Woods that are difficult to split include elm, sycamore, gum and mesquite. Some easy-splitting woods include ash, red and white oak, birch, hickory, Eastern white pine, sugar pine, white cedar, eastern red cedar and juniper. Splitting qualities matter more if you're splitting the wood yourself, but you should bear in mind that wood that's hard to split may cost more if you're having someone else split it, since it will take more work to get it ready for you. Some wood, especially softwood, pops or gives off sparks when it burns. This happens when trapped gases explode in the moisture pockets contained in the wood. Your fireplace should have a screen over it to protect the room from sparks. Hardwoods that don't spark include ash, red oak, white oak, beech, birch, hickory, hard or soft maple, pecan, cherry and walnut. Some softwoods don't spark, either. Good choices include Douglas fir, redwood, cypress, Eastern white pine or sugar pine. Hardwoods don't tend to smoke as much as softwoods. Ash, red or white oak, beech, birch, hickory, hard or soft maple, pecan, cherry and walnut are all good woods to burn in your fireplace and won't give off a lot of smoke. If you need to burn softwoods, choose cypress, Eastern white pine, sugar pine, true firs or redwood. They all emit a medium amount of smoke. Burning well-seasoned firewood will reduce the amount of smoke that's emitted. Fireplaces don't heat as well as wood stoves do, so you want to choose wood that produces a lot of heat. Wood density affects heating values, which are measured in British thermal units (BTUs). Heavier, denser woods have higher heating values. All air-dried wood yields around 7,000 BTUs per pound, no matter what species it is. The number of pounds contained in a cubic foot of wood varies a lot, however, depending on the species. One cubic foot of black locust, for example, yields almost as many BTUs as two cubic feet of cottonwood. Ash, red oak, white oak, beech, birch, hickory, hard maple, pecan and dogwood all yield a lot of heat. Soft maple, cherry and walnut are also easy to burn, but they only give off a medium amount of heat. 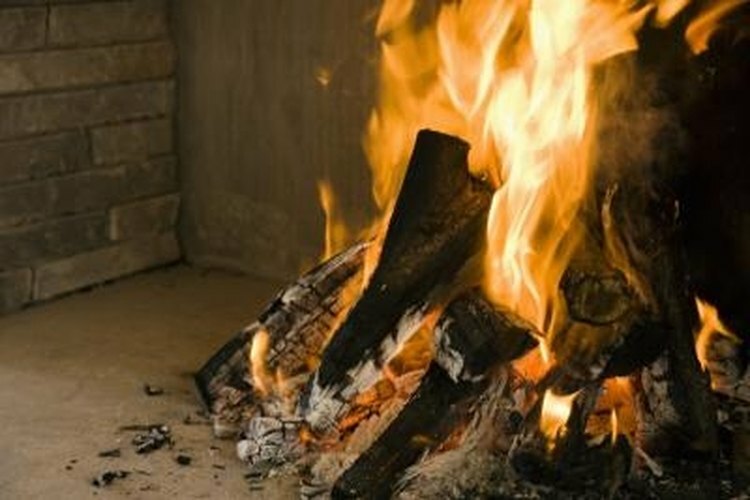 Why Does Some Firewood Produce Excessive Smoke? What Type of Wood Makes the Strongest Walking Sticks?